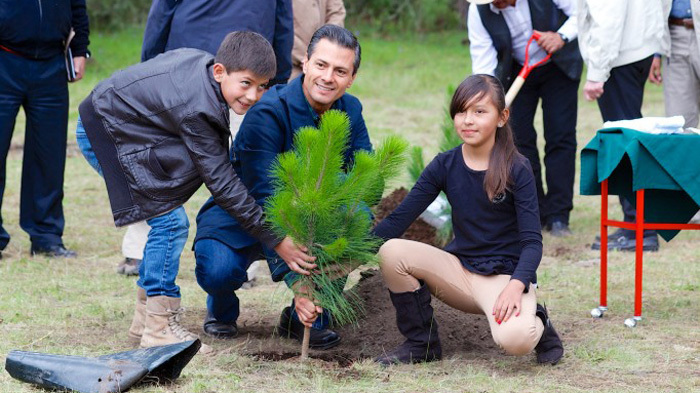 Two days after having announced via Twitter that he means to improve the air quality in the Megalopolis, President Enrique Peña Nieto reiterated that before he leaves office, 18 million trees will be planted in the north of the Valley of Mexico. “Reforesting with 18 million trees, covering practically 30 times the area of the Chapultepec forest, is the legacy we are creating in this great Megalopolis that has more than 20 million residents,” he said. To mark Arbor Day (July 15) in the community of Nanacamilpa, Tlaxcala, he reported that nearly 600,000 hectares have been planted with trees, which represents 60 percent of the 18 million trees set as a goal. “We have not only achieved reforestation, but have also established trees with the best survival rates, a better rate than we have had in the past. Today for every 10 trees we plant six will live, as opposed to a rate of reforestation that used to be fewer than three of 10 trees planted,” he said. The president also announced the founding of the National Reforestation Campaign, which will have the goal of creating a better country for future generations. “I am the first to recognize that in a country with no planting in six years, without doubt the contribution that my administration has made ought to be significant and ought to create conditions that result in better opportunities for our people,” he said. Environmental and Natural Resources Secretary Rafael Pacchiano pointed out that the fight against illegal tree cutting has brought about a reduction of that activity by up to 76 percent, and that there has been an increase in the number of firefighters, at 2,600 in the previous administration, to more than 18,000 in six regional centers, which will allow the government to better combat forest fires.